ENS Cattle Company LLC was established to fulfill a dream. I have always had a love for cattle and all that goes with it. Our main purpose is to establish a registered herd that will assist our customers and ENS Cattle Company LLC reach our goals. There are a lot of cattle in our industry and many are very good cattle that come from fine ranch operations. It has been my experience that a program is as much or more about the people within that operation along with the quality of cattle. To know the background of our cattle is very significant for us as it is for most breeders. I have seen many commercial breeders that have very good herds some know their pedigrees and backgrounds while others wish they did. Selling pounds of beef and raising quality replacement stock is still what much of the business is about. I feel to be able to offer quality seed stock for the commercial and purebred breeders is what it is all about. 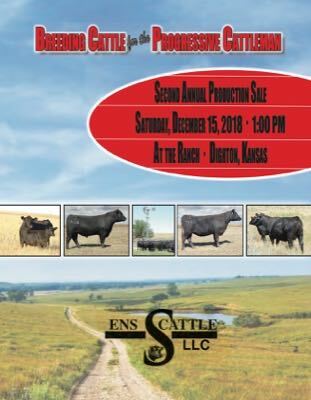 ENS Cattle Company LLC has been for the last three years using the Zeotis HD 50 K Genomic testing for all our registered calves and herd sires. Family, hard work, fun and profitability make this all worthwhile. My son Erik graduated from McPherson College and has become a full partner in our operation. Erik is a vital part of this operation and part of the enjoyment is working together. My wife, Kathy and daughter, Kiara Rolfs are less active, but enjoy the cattle too. How I got started. I have been in the business in one form or another my whole life. When starting ENS Cattle Company LLC, I looked for fellow breeders who had many of the same goals and objectives that I had; one that would not only sell me the cattle but would work with me to give direction. This is a fine line when working with fellow breeders and commercial cattleman, to find someone who can give you honest direction and help you establish your own set of criteria and not just sell you cattle. ENS Cattle Company LLC is committed to helping our customers become partners in business and willing to go the extra mile to make your future and your cattle what you envision them to be.